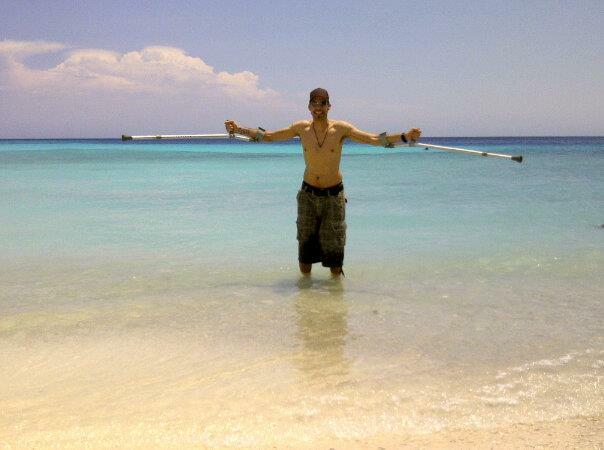 2ndLife Curacao is founded by “yu’i Kòrsou” (native Curaçaoan) Andy Kirchner. On May 19th 2012, Andy and his girlfriend, Debbie van der Woude, had a scuba diving accident at Marie Pompoen. The accident cost Debbie her precious life to a pulmonary embolism. Andy was stricken with caisson disease, also known as “the bends”, and a spinal injury left him paralyzed from the waist down. Andy would not accept the neurologist’s prognosis that he would not walk again. He said, “I did not fight and survive to live my life in a wheelchair”. Several treatments in a decompression chamber and grueling physical therapy helped to regain some of his strength and ability to move again, but it would take more than just therapy to get him where he knew he wanted to be. When he was released from the SGR Monseigneur Verriet rehabilitation center in October 2012, the future wasn’t looking too bright. There was no social structure to help him regain his independence, and he was forced to move in with his parents. This created a lot of financial and emotional stress on the family. He knew that if he were going to reach his potential, he would need to take matters in his own hands. By learning about his disabilities he started to develop his abilities. Growing every day stronger by doing yoga and Pilates exercises and reading when he needed to rest to increase his knowledge. Beating adversity standing up from his wheelchair, to walking with two crutches and eventually even walking without a cane. Life continued and so did Andy’s development. As he became stronger, he was appointed commissioner for the National Sports Development Foundation (FDDK) to advocate for handicapped (sport) rights. Meanwhile the idea for 2ndLife Curacao and The Recycled Pirate | life awareness & innovations was already on the drawing table. 2015 was the year to hatch again. Joining the Curaçao Paralympics delegation in March Andy learned he wasn’t ready to shine yet, however it was a great learning experience and warming up of what was yet to come. In April 2015 he opened the show for Levi Silvanie with an inspirational speech for the clip presentation of #Superando starring Alton Paas. In May he shined on the cover of GO WEEKLY magazine with a featured interview and just a month later Andy won the prestigious JCI IOBA Curaçao Aspiring Young Creative Entrepreneur of the Year Award and with that the jump start for his own, long time envisioned, sustainable business Buccaneer’s Enterprises B.V. that is the umbrella company for 2ndLife Curaçao and The Recycled Pirate. The inspiration for 2nd Life Curacao came during therapy sessions, while observing people with all sorts of disabilities. From children born with physical and/or mental disabilities to adults recovering from strokes or accidents and several amputees. They were all fighting to be “able”. Often, these people are seen as a burden because of the time and cost associated with their care. Additionally, insurance restrictions and government funding can make it nearly impossible to gain the skills and opportunities necessary to be a productive member of society. During a therapy session while Andy lay on a mat he saw an elderly woman stand up from her wheelchair, adjust her prosthesis, and said “I may not be complete, but I’m not broken.” This was when Andy realized everybody deserves a 2nd chance and the idea for 2ndLife Curacao was born! No one wants to be dependent from their family or government for survival. Doesn’t everyone have the right to the independence and self-esteem that comes with supporting yourself and contributing to your world? Doesn’t everyone deserve a 2nd chance? For Andy these people became his motivation. They inspired the business endeavor that later brought him the title of “Aspiring Creative Young Entrepreneur of the Year” from JCI IOBA. It would have been easy to focus on his own struggles. It would have been understandable for him to work to improve his life alone, yet, Andy had a vision. A business idea, a new way of thinking and giving care. The idea would allow people like him to gain independence, to make a living, to contribute to society rather than take from it. From this inspired way of thinking, a vision began to take shape. The idea behind 2nd Life Curacao is that life continues, anywhere, everywhere. Life was there before you and it’s going to continue after you. It will be left for your children and hopefully your grandchildren’s children too. It’s important for what we leave behind. Our social environment is the measurement of personal growth and a healthy economy. A social life is more than just greeting each other or donating for a good cause. A social life should be built on the structural improvement of our society to lower the pressure on our financial system by giving its members tools to empower themselves. It means helping our society where it needs help the most. A better perspective for the ones that need it the most will not only benefit our society, but also and primarily our economy. That social life doesn’t stop in your street or neighborhood or your favorite bar or church community. It goes on further than you’re fully capable to comprehend and grows further than any of us can reach. For example, helping the lady with the flat tire by the side of the road is where it starts, but making a beautiful planter out of that tire is where 2nd Life Curacao is really going to make the difference. We live in the era of awareness and you, we, can all be part of a stronger social future. The philosophy of 2nd Life Curacao is simple: Life can, and should, go on! We will benefit globally by taking our underutilized resources (material and human) and giving them new purpose. As a nature lover, social worker and tour guide, Andy was inspired to make a difference and committed to something authentic for his beloved Curaçao that would also reduce waste and create awareness for various social matters and with that reduce cost along the way and still impulse his economic situation. To see the vision through, Andy made a list of goals he would need to accomplish to be successful. He needed to gain physical strength, develop his artistic skills, and come up with interesting products for an international market. Starting with just his social pay (onderstand), some old brushes and a little paint, he started creating for hours, until his body could take no more. Rest, train, write and create, day in and day out. During this time, the rehabilitation clinic ended the formal therapy. He took the doubt and fear of not having any nursing support and used it to push himself harder. Improve physically and harden mentally, making 2ndLife Curacao a success became his obsession. As his body became stronger, so did his vision and his work start paying off, he was ready to officially bring his products to the market. The first sale was 4 cans for 60 guilders ($ 33) in August 2014 to a Dutch tourist. That money was invested back into 2nd Life Curacao, in the form of tools and paint but also training and fitness materials. Some friends and acquaintances started to buy candle holders, hand painted pegs, kalbas (squash), rocks (press papers), hand painted coconuts, and many other items crafted with all of Andy’s heart, in the backyard of his parent’s house. With the profits, came more paint, more tools, endless research and more ideas. The first business to business sale was November 2014, restaurant Sambal at Zuikertuintje bought 13 candle holders, soon followed by Twindivers, Trustmoore and his biggest customer yet 27 Bar in the Pietermaai district. 2ndLife Curacao was gaining the momentum Andy envisioned as his art even started traveling from his island all around the world spreading a message of hope and love. 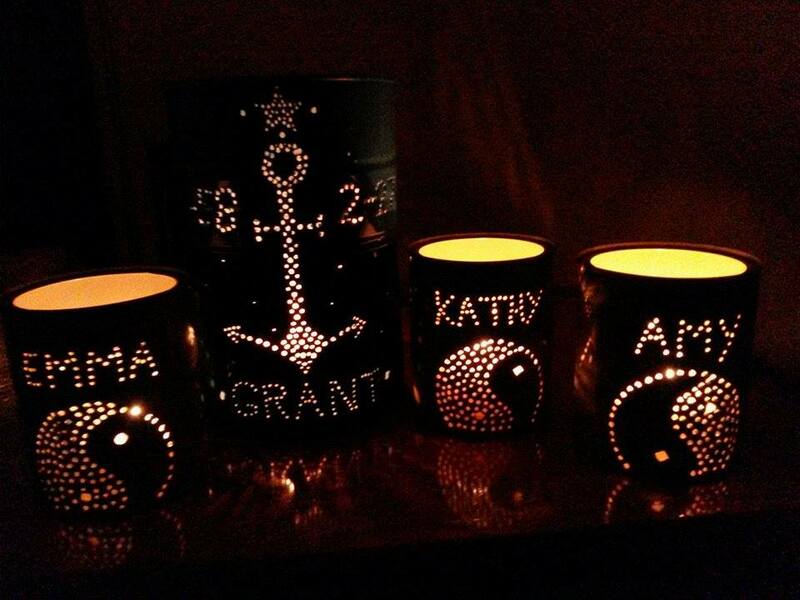 A commemoration set for Kathy and her daughters Emma & Amy for their in February 2015 passed away husband and father,Grant. Our first Canadian visitors and the first set to cross the Canadian border was immediately a very special one. At 2ndLife Curacao we believe in sustainability and taking responsibility. This means leading by example in all we do. Starting up, we planned to become a foundation to gather funds to establish the project. After several informative meetings with a variety of consultants, it seemed to send the wrong signal to the world. Gaining funds and developing programs shouldn’t be limited to the goodwill of people. Also, the idea of another foundation that would need to depend on government funds, goodwill and charity just didn’t feel right. Independence creates respect. Not only will people respect us more but we’ll create more awareness, more goodwill and achieve more by taking matters into our own hands. We will lead, as an organization. by demonstrating what the possibilities are. By creating sustainable products from recycled materials we have very low “buyers” cost and fair profits. By telling the story behind the products and the creators we create more than just goodwill. By putting these stories together we can generate our own funds instead of asking for them and we’ll give our island something to be truly proud of. We started with an onderstand (social pay) of NAf 162,- ($89) every two weeks and we are slowly building a healthy business without additional funds. Our growth is slow but steady, and our risks are limited. We’ve shown that with a sustainable product, financial benefits are possible. Now we are preparing for future expeditions and growth is just a small step away. Our future plans will approach schools, NGO’s and businesses around the island for workshops, team building events and lectures with The Recycled Pirate and 2ndLife Curacao. Cans are collected by schools and are donated to 2ndLife Curacao. The schools participating get awareness classes and workshops. These classes will contain lesson materials for environmental issues and (separately) how people deal with handicaps and disability. 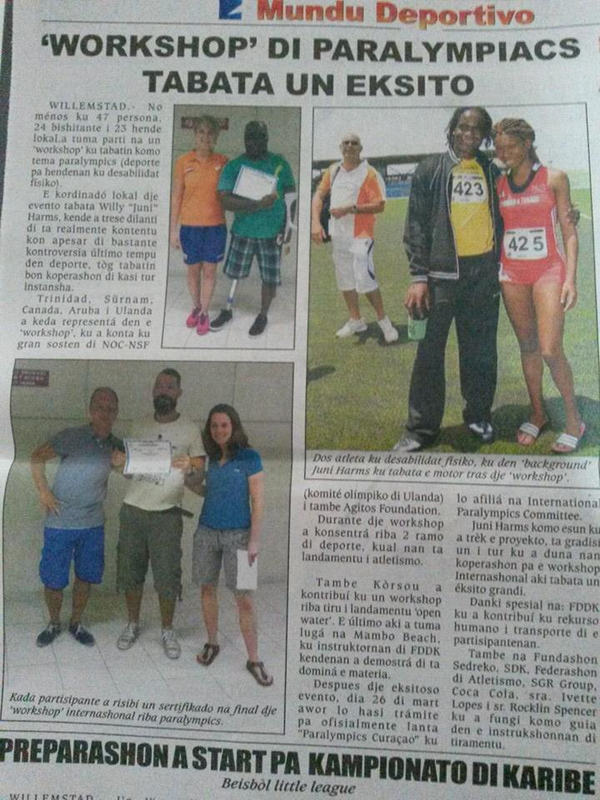 The people giving these workshops will be selected and trained handicapped members of 2ndLife Curacao. Our first collecting test with Krijt school was a major success and resulted in 6 boxes with more than 300 cans. Pallets, tires and other (waste) materials will be collected at participating companies helping them reducing waste and clean up. We use those materials create new products (planters, signs, souvenirs etc.) and to create lesson materials (see example 1). We will attend several porch sales where we can buy needed materials and tools for future projects. These materials can be chairs or tables or any other household items. These again can be used in the prior given examples and sold with good margins for future endeavors. Everybody benefits from this structure. We help keep the island clean, we give people with a disability a chance to develop a variety of skills fitting to their possibilities and the participating schools and companies get their free marketing while increasing their productivity by having to deal less with their waste products. With the profits we’ll build a healthy business for our participants and the future of our island. The participants will be paid accordingly to the work they can deliver. For some that means a full time job, for others part time and for a lot of people it can be a freelance or “paid by product” employee. Every participant is equally important as they are an example to society, an impulse to the economy and less depending on solely the minimum onderstand (social pay). A social worker will eventually be needed to guide these (future) projects together with the necessary professionals to cooperate with local schools, NGO’s and businesses. 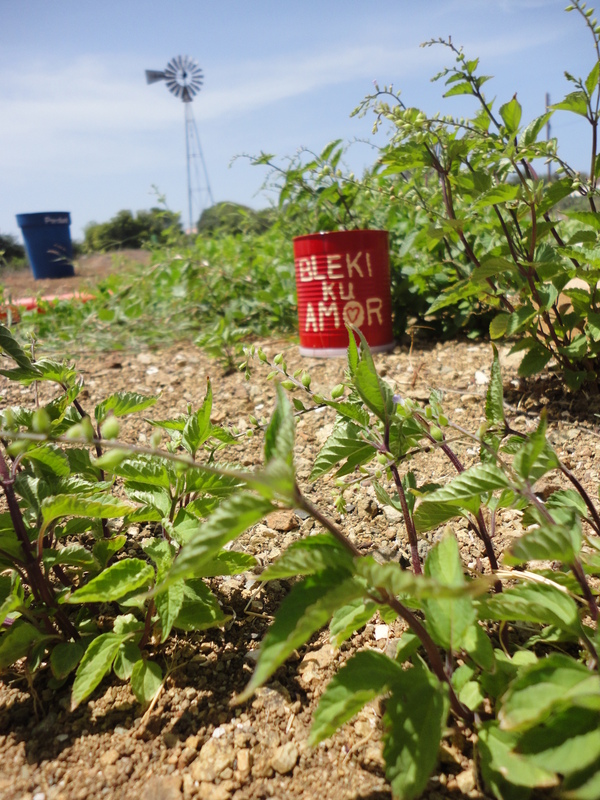 Interest has been shown in this concept since it helps take care of the social part of rehabilitation without high cost and increase the much needed awareness of our environment. .
Bleki ku Amor (Can with Love). A hand painted recycled can as a planter with edible herbs to keep giving love. It stands, of course, for the repurpose of materials and recycle or upcycle of them for a new life. It stands even more for being more aware of life. You can’t recycle time. Once wasted it’s gone. However by accepting that that time has passed we can use the time lost to improve ourselves with the knowledge gained. 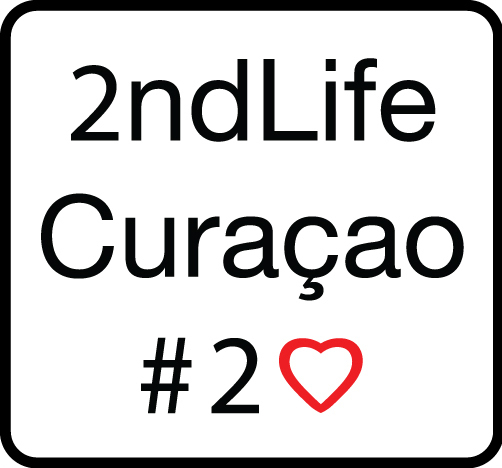 The 2nd Life Curacao logo is vital for communicating the philosophy and vision that inspired the creation of 2nd Life Curacao. When developing this logo it was important to show a combination of the old and the new. Of the future and the past. Of an international ambition with a local flavor. We are all one. We may differ in color, shape, thoughts and goals in life, but we all need to breathe the same air. In that we are one, captured by our most important necessity. We chose a simple letter type, Arial. It’s basic. It’s simple. We want to breathe simplicity, not making things more than they are but create more with less. With this in mind, we chose a simple and widely accessible font and a simple two color design. This simplicity allows us to save costs and conserve resources through low cost printing and environmentally responsible amounts of ink. 2ndLife stands for 2nd chances in every meaning of the word. The products we use, the people we want to reach and the chance we want to give the world and its environment. We are based on Curaçao and we want to carry that out to the world. We want to show what a small island can do with bigger meanings and while we’re at it, promote help our tourist industry. We live in a new era with new technology and we carry that out by the way we do business and show our face. An innovative way to look towards the future with more awareness about what we do, how we do, and more important, what we leave behind. Again, the 2 stands for 2nd chances in every meaning of the word. The products we use, the people we want to reach, and the chance we want to give the world. The heart is our core. It’s love, it’s what we give and what we hope to receive. It’s leading by example. Together with the two it says “to love”. 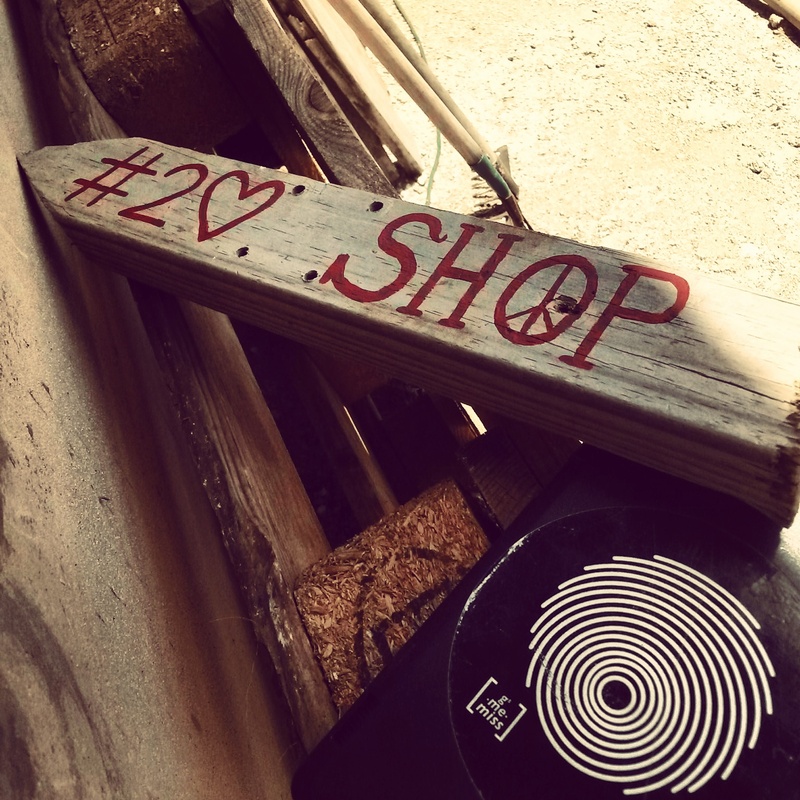 The 2nd Life Shop signs with Levi Silvanie’s #GsMeMiss fingerprint.